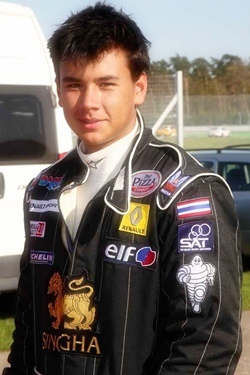 The Royal Automobile Association of Thailand (RAAT) and Sport Authority of Thailand (SAT) have officially announced their support for 15 year old Sandy Stuvik as the Thai Athlete Representative for competing in Formula Renault Eurocup 2011. The young Thai racer, who last year became the youngest Asian Formula Renault Champion ever, was invited to race by many teams in Europe, but he has settled on the Danish team Keo Racing for the 2011 season. Sandy said, “Eurocup will be a tough challenge for me, considering all the young talented drivers from around the world competing in this series. I have so many things to learn for this year. Everything is quite new for me. It is my first time to experience all tracks. Even it is still formula Renault, but the engine and the gear are totally different. The engine and car body are bigger than last year and it is paddle shift gears, the same as in Formula 1, with electronically managed downshifts. Fortunately, Sandy has a few years up his sleeve to graduate through the ranks, so 2011 will not be a ‘make it or break it’ year. The first race of the season was 16-17 April 2011 at the Motorland Circuit in Spain followed by Spa Francorchamps, then Nürburgring, Hungaroring, Silverstone, Paul Ricard, before ending back in Spain at Catalunya Circuit in October. Racing drivers who have graduated from Formula Renault Eurocup and are now in Formula 1 include Pedro de la Rosa, Felipe Massa and Kamui Kobayashi. Next articleNow is this thing ‘cool’ or not?